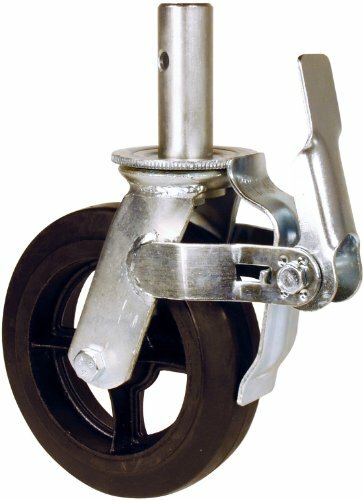 The locking stem scaffold casters are made to accurately brake at various positions. Swivel section is equipped with a lubrication fitting for field maintenance. Legs are made from 1/4" steel and are welded to the outer race both inside and out for added strength. The brake support brackets are an integral part of the leg stamping, not welded on. This ensures accurate brake lever positioning and provides a sturdier brake support structure. Stepping on the brake handle simultaneously locks the wheel and swivel assembly. The swivel lock portion uses serrations in the brake lever and top plate to ensure a positive lock. 1/2" Diameter steel axle and 2" tread wheel. If you have any questions about this product by RWM Casters, contact us by completing and submitting the form below. If you are looking for a specif part number, please include it with your message.